1 What are Northern Lights? Northern Lights or Aurora Borealis has become one of the most popular attractions Iceland has to offer. Year after year, the Northern Lights consistently rank as one of the top reasons tourists choose Iceland as their destination. An increasing percentage of visitors pay for guided northern lights tours while some opt for a self-drive northern lights hunt. During the cold, dark months of winter, this has surely become one of the hottest Icelandic activity tours. Those that have witnessed the Northern Lights in all their glory do of course understand the appeal. Their shapes, colors and varying forms and intensity can surely get you to stay out in the cold winter night, gazing at the sky for hours over and over again. This spectacular natural phenomenon simply does not get old and even keeps surprising those of us that are lucky enough to have these mesmerizing lights dancing over our heads on a regular basis. As a local, I can attest to that. I have been eagerly hunting for the Northern Lights for years and the best show I have ever seen was just less than two years ago. So they are still surprising me. 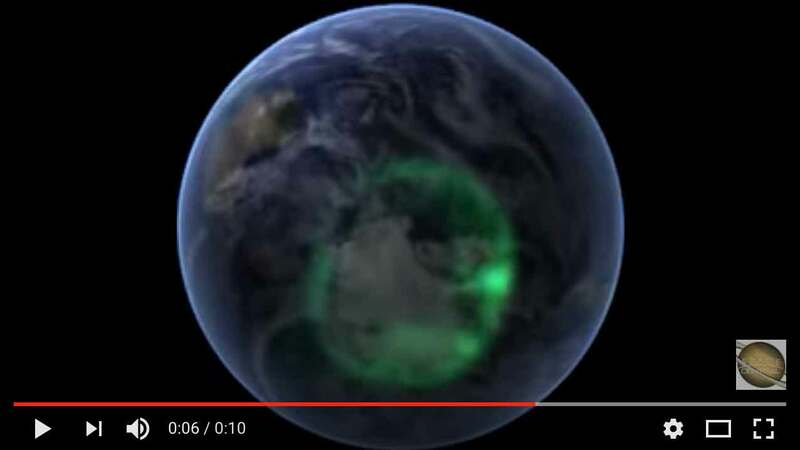 The Northern Lights have a southern counterpart but for reasons, later explained, the Aurora phenomenon is mostly bound to the poles of our planet – and some other planets for that matter. The North Pole and the South Pole. The Southern Lights are called Aurora Australis. Even to this day, there are many things scientists do not know about the nature and formation of this spectacular natural wonder. Some might say that there is more charm, and perhaps more mystery, in the way our ancestors tried to explain them. I would, however, argue that science hasn’t taken away the magic. That’s not to say that the Northern lights being a reflection of light off the shields of Valkyries flying across the sky to their resting place, Valhalla isn’t a fun theory. But hey, isn’t electrically charged particles, atoms, Solar wind, Solar storms, coronal mass ejections and interplanetary magnetic fields as well? It takes two to tango and this romantic tale (and the answer to the question: what are Northern Lights?) starts at the very center of our solar system, 93 million miles (150 million km) away. Or 8:20 light minutes away. It is at the very core of the glowing ball of plasma we call The Sun where it initially begins. Deep in the Sun, hydrogen fuses to create helium in a nuclear fusion process, much like in plutonium atom bombs. This is the ultimate source of its fierce energy in the form of light, heat and other radiation that we can see and feel here on Earth. The Sun is constantly emitting charged solar particles out into space and some of it, towards us. Most people believe the Sun to be huge. That’s what we are taught early on. But interestingly, the Sun is not that big at all, at least not in astronomical sense. In fact, it is classified as a G-type star which is also referred to as a yellow dwarf. But this is all relative of course. To us, the Sun is a bonafide giant. After all, the Sun has about 99% of the mass of our entire Solar system. It being the elephant in the room is, therefore, a bit of an understatement. Makes you feel a bit like star dust, doesn’t it? The Sun is ever changing in activity levels. Sometimes she’s calm and easy going but then there are these times when she lashes out with various intensity. As with all things, we have classified the Sun’s varying degree of activity. The mildest and most prevalent form is the solar wind which is pretty much constantly going on. When she’s moody, on the other hand, she throws at us bursts a solar storm or even something called coronal mass ejection (CME’s). It is very useful to understand how the varying levels of activity result in different volumes of solar material being ejected and also the different speeds at which this material travels. This is useful as these play a key role in aurora formation. First, let’s talk about the Solar wind. 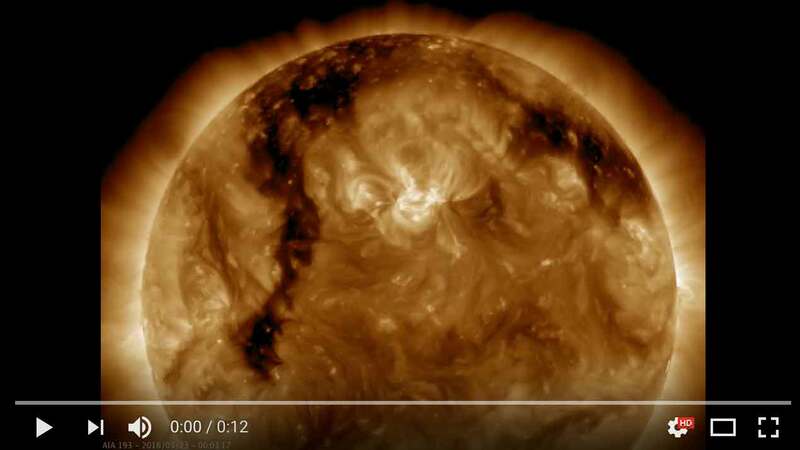 This is a stream of charged particles that flow from so-called coronal holes. 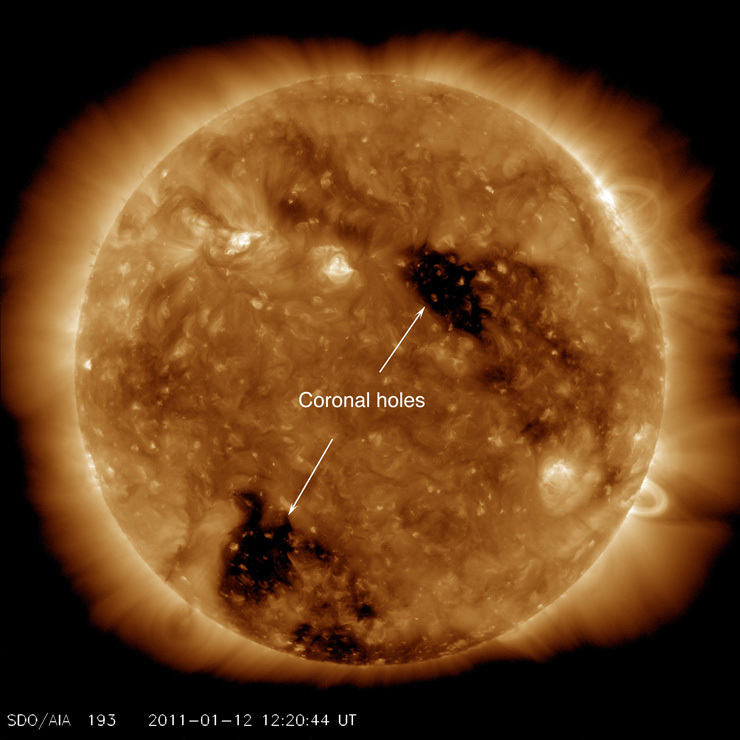 Coronal holes or sunspots are regions in the sun that are less hot and less dense than it’s surrounding. For this reason, they appear as dark spots when the Sun is observed through a telescope (with special solar filters of course). The solar wind travels at about 190 to 500 miles/s to (300 to 800 km/s). These usually result in low-scale aurora activity. Solar flares, on the other hand, are magnetic storms that appear to be very bright when they occur and are often associated with coronal holes. These are in fact gaseous eruptions that release a tremendous amount of gasses and particles. You can think of these like volcanic eruptions – only a gazillion times more powerful. Then there are the Coronal Mass Ejections or CME’s. Think of these as huge balloon shaped blobs of plasma. These bursts release up to 220 billion pounds (100 billion kg) of plasma and rage at velocities up to 1.900 miles/s (3.000 km/s). As with solar flares, CME’s are also associated with coronal holes. CME’s can disrupt Earth’s satellites as well as seriously damage components of our electricity grid and wireless communication systems. Fortunately, there is no need for us to put on a tinfoil hat, though. Mother nature has already provided one (sort of). More on that later. To find data on the current state of the Sun, I suggest using www.spaceweather.com. 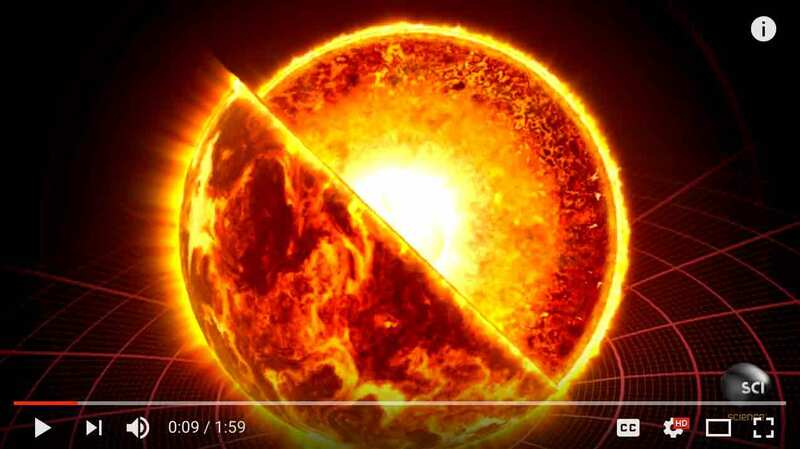 A great resource for data on solar activity and space weather. 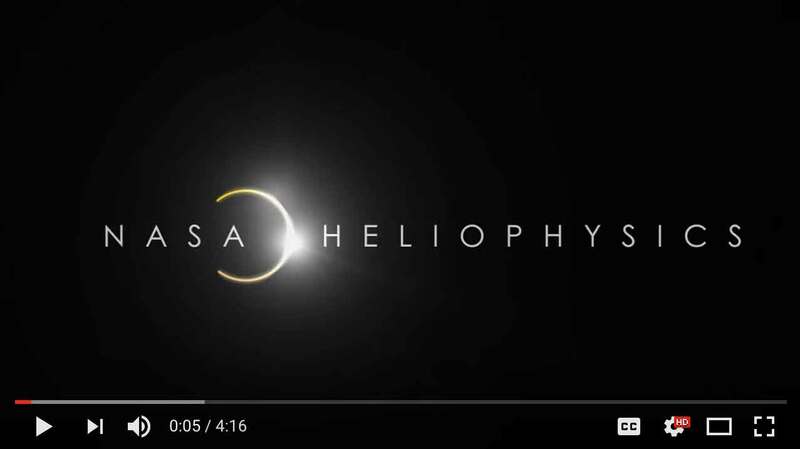 The mood analogy just can’t be concluded without talking a bit about solar cycles. 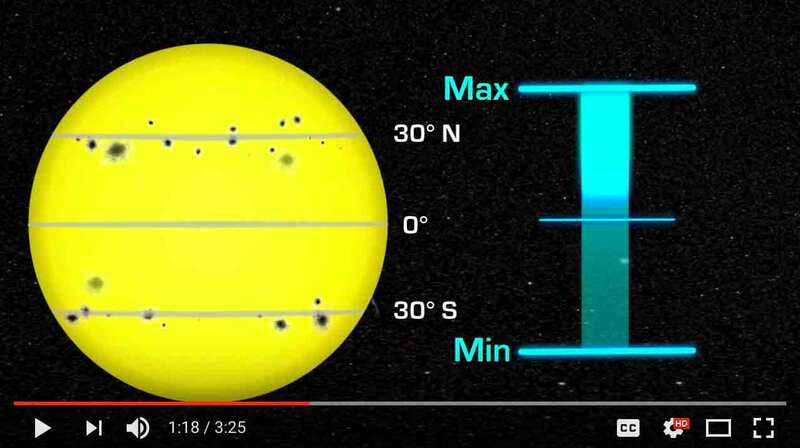 Yep, The Sun goes through cycles from high to low activity and another cycle where the poles of the Sun actually flip. First, lets talk about the sunspot cycle which is about 11 year long from low to low activity. During the height of this cycle, the number of sunspots is high whereas during the solar minimum the number of sunspots is low. Placement of sunspot also changes throughout the cycle. During solar maximum, the spots tend to appear at mid-latitudes but move closer to the equator during solar minimum. The Sun’s activity level can actually be visually observed by observing the size and number of sunspots. In fact astronomers have recorded the number of sunspots each day since 1749 now so we have historic data on solar cycles running back 22 sunspot cycles or so. You can even observe sunspots yourself if you have a small telescope fitted with the appropriate solar filter (please note that viewing the Sun through a telescope without the appropriate filters will seriously injure your eyes). The sunspot cycle is a part of another cycle. The 22 year long Hale cycle. Interestingly, every eleven years or so the poles on the Sun flip. South coming North and North coming South and the Hale cycle is the cycle where the poles come full circle. The last solar activity maximum was in 2013. Interestingly this was the weakest solar maximum recorded in 100 years. However, do not make the mistake of assuming that you are too late to catch the Northern Lights. The Sun is quite active 3 years to and from the maximum and even after that, it’s not like the lights are shut off. From the viewpoint of the aurora hunter, this only means that very strong peaks in activity are less frequent. If you, for instance, book a tour with professional aurora hunters, they will cancel your tour and offer you to re-schedule if they don’t deem sightings to be likely. For this reason, it is clever to book your Northern Lights tour early on during your stay so you have a chance to re-schedule. Ok, we’ve covered much of what can be said about the main culprit in forming the Northern Lights. Let’s get to what happens when the energy coming from the Sun hits the Earth – once thought to be the center of the universe, no less. Another romantic fantasy ruined by boring scientists! Our wonderful home planet is surrounded by an invisible force field. A magnetic field. This is the tinfoil hat I mentioned earlier. This invisible field is the product of electric currents that result from friction as molten metals in the Earth’s outer core swirl and convect. As long as the Earth keeps spinning and it’s core stays molten, we will enjoy the many benefits of having this magnetic field. Without going into too many gruesome details about it, it’s not just about the Northern Lights, though. Let´s just say that you would not be reading this or anything else if not for this protective layer. From the outer core of the planet, this field extends far out into space. 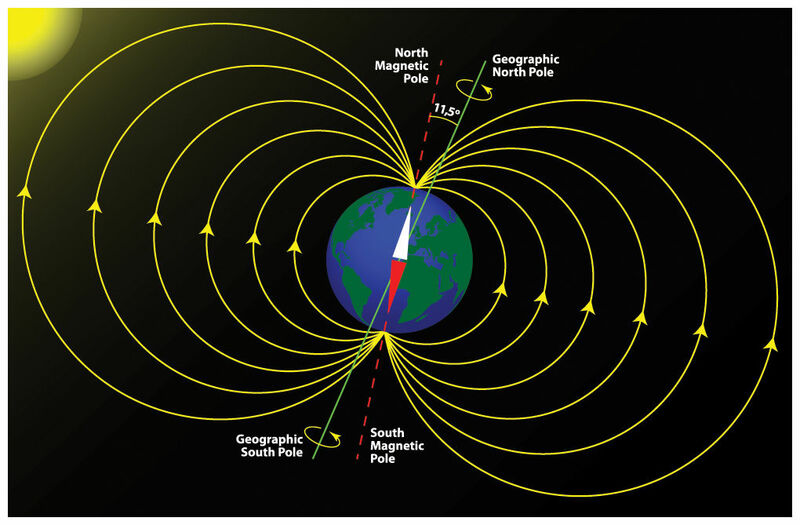 In fact, a magnetic field line from Reykjavík reaches almost 22.000 miles (35.000 km) into space. 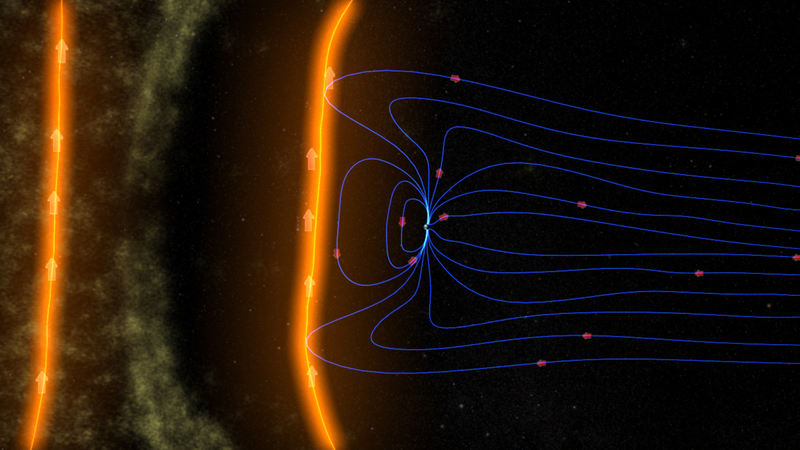 The magnetic field lines are directed toward Earth around its poles. This image nicely depicts the magnetic field lines. The interaction of particles beamed from the Sun and Earth’s magnetic field can be described in broad terms as such: Charged particles from the Sun collide with Earth’s magnetic field (This is not where the lights are formed). Some particles get deflected while others get stuck in Earth’s magnetosphere and then get accelerated and flow along the field lines down towards the poles. The particles travel at very high velocity and eventually collide with the atmosphere. The atoms and molecules in our atmosphere get excited and as they go back from the excited state to ground state, photons are born. Photons are the lights, by the way. The Northern Lights form in a region best described as ovals around the poles. The oval is about 1.240 miles (2.000 km) in radius and about 310 miles (500 km) wide. Iceland just happens to be perfectly positioned under the oval surrounding the North pole. This means you can see Northern Lights in Iceland even when the activity is relatively low. Think of it like this: When activity is low, the ovals are smaller and closer to the poles. When activity is great, the ovals grow and extend further southward towards the equator. This means that from Iceland, you are more likely to see aurora straight overhead or even in the south sky when activity is high. There may ever have been relating to Earth atmosphere and it’s composition. In fact, they have pretty much figured out what exactly Earths atmosphere is comprised of and how it is layered. 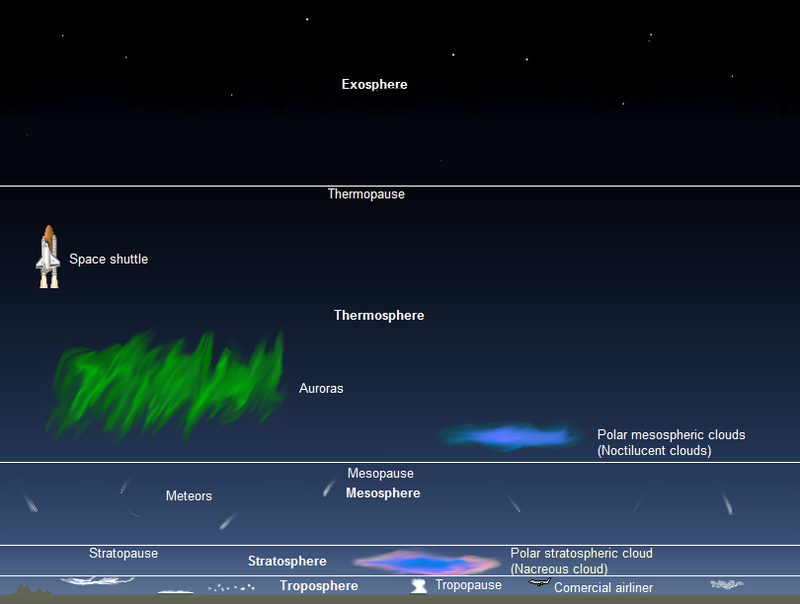 The Earth’s atmosphere extends far into space. About 300 miles (480 km). There is no defined place where the atmosphere ends and outer space takes over, the atmosphere just gets thinner and thinner until it merges with outer space. Its composition is 78% nitrogen, 21% oxygen, 0.9% argon, 0.03% carbon dioxide, and then it has trace amounts of other gasses. Earth’s atmosphere is layered and as the gasses in our atmosphere have mass, therefore it has pressure. For this reason, most of its gasses (80%) are below an altitude of 10 miles over Earths surface. The layers of our atmosphere are (from low to high): The troposphere, the stratosphere, the mesosphere, the thermosphere and finally the exosphere. As we know the composition of each layer and which colors of the Northern Lights are the product of which gas molecules, we can deduct roughly how high the lights we are watching are. The Northern Lights form at altitudes ranging from about 50 to 250 miles (80 to 400 km). Now that you know that our atmosphere is layered and that the colors of the lights are dictated by which gas molecules are interacting with the charged particles, it can be fun to know a bit more about how the different colors are formed and at what height. Green is the most common color and is created as solar particles are colliding with oxygen atoms, 60 miles (100 km) high. lower red as solar particles collide with Nitrogen at less than 55 miles (90 km). The lower red is common during solar storms. As our eyes are not particularly sensitive to light at this wavelength so the lights have to be strong for us to see it which they sometimes are. Then there are the purple and blue that are evident of Ionized nitrogen. White color is seen if all the colors mix or the lights are very dim. The Northern Lights often appear as curtains of lights following Earth’s magnetic field lines. But they can also come in the form of arcs in the distance or even spirals and the spectacular corona (my personal favorite). Sometimes you have a static arc far in the north sky. This is when you have low activity (given that you are viewing from Iceland). The curtains of lights or drapery aurora often move (like drapes in the breeze). This is quite spectacular to see. The corona forms when you are situated right under the drapery aurora. There is simply nothing like it, when the lights are strong they can seem like a river of light flowing past you right overhead. Truly mesmerizing! The intensity of Northern lights varies a lot of course. It’s not every night that you can expect high activity and/or the lights to be in their best light (wow, I’m funny). I find that when it comes to the intensity of the lights, they tend to follow the normal distribution. I.e. most often they are average, seldom are they very poor and seldom are they incredibly vivid. But hey, I live here. To most people that aren’t used to this spectacular phenomenon they have to be very poor to my measure to not make the observer very happy. And I’ve seen more than a handful of first-time-observers in my time. By now you should have a fairly good picture of what forces are at play in forming the aurora, and hopefully the question What are Northern Lights and What Causes Them? is now thorougly answered. A deep knowledge of this process does two things; It is more fun to observe the wonders of the night sky as you have knowledge of what you are seeing. I believe it ensures a more enriching experience. And secondly, knowing this should save you from falling prey to unhelpful misconceptions. All too often I hear of people missing out on the Northern Lights as they have wrong information. On the other hand, sometimes (less often though) I hear from people that go aurora hunting when basic knowledge would tell them that success is highly unlikely. Iceland is perfectly positioned under the northern aurora oval. It is a great place to go if you have always dreamt of seeing the Northern Lights for yourself. Getting away from light pollution is easy. You can stay at a downtown Reykjavik hotel and join a Northern Lights tour or go hunting on your own without having to camp out in the middle of nowhere. Regardless of whether you choose a guided northern lights tour or go northern lights hunting on your own, I wish you good luck and it is my hope that your understanding enriches your experience! 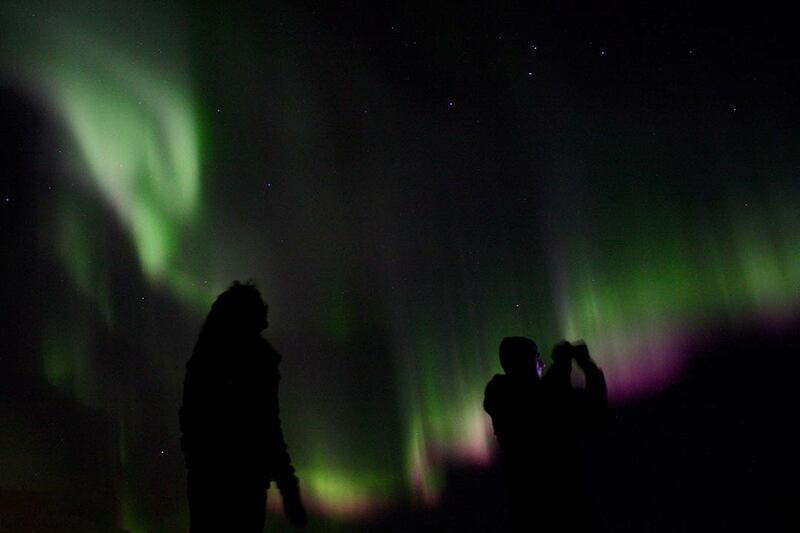 If you would prefer a guided tour, feel free to check out our Northern Lights and Stargazing tour! We do small groups only and would love to have you on board!